This is part 5 of this series. In this part, we will focus on enabling Eureka Naming Server and have the microservices communicate with it. What is the need for Naming Server? How does Naming Server enable location transparancy between microservices? In Parts 2 & 3, we created two microservices and established communication between them. In Part 4, we used Ribbon to distribute load between the two instances of Forex Service. However, we are hardcoding the urls of both instances of Forex Service in CCS. That means every time there is a new instance of FS, we would need to change the configuration of CCS. Thats not cool. In this part, we will use Eureka Naming Server to fix this problem. Creating Eureka Naming Server with Spring Initializr is a cake walk. 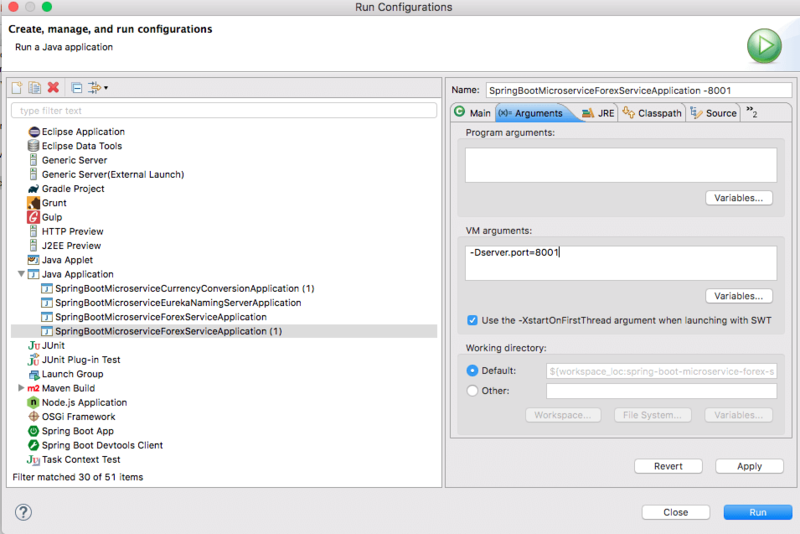 Launch SpringBootMicroserviceEurekaNamingServerApplication as a Java application. You would see that there are no instances yet connect to Eureka. Restart all the instances of CCS and FS. You would see that the CCS and FS microservices are registered with Eureka Naming Server. Thats Cool! Screenshot shows how to launch an additional instance of Forex Service on 8081. 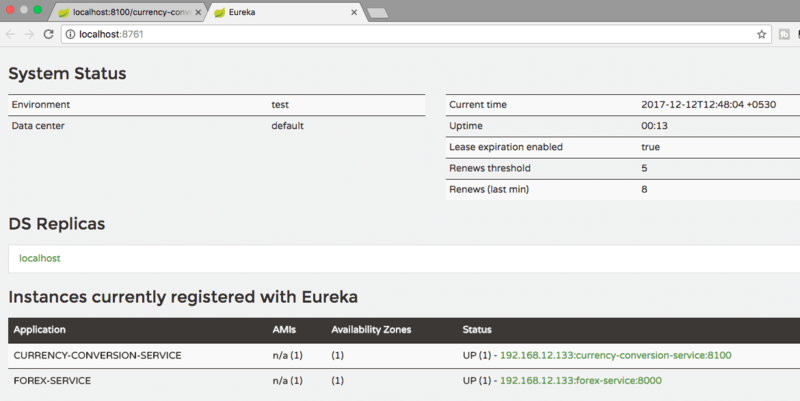 You would see that one instance of CCS and two instances of FS microservices are registered with Eureka Naming Server. Now you would see that the requests to CCS would get distributed between the two instances of Forex Microservice by Ribbon through Eureka. Cool! Thats awesome. Isn’t it. We are using Ribbon to distribute load between the two instances of Forex Service and Eureka as the naming server. When we launch new instances of Forex Service, you would see that load is automatically distribute to them. The idea behind these series of 5 articles was to give a flavor of Spring Boot and Spring Cloud with Microservices. There is a lot more ground to conver with Microservices. Until next time, Cheers!